Being in the right place at the right time gave a group of Massachusetts research astronomers a unique opportunity to study Pluto's largest moon Charon. The resulting measurements, to unprecedented accuracy, of Charon's size and possible atmosphere provide insight into the way this distant world may have formed. On July 10, 2005, astronomers from the Massachusetts Institute of Technology (MIT) in Cambridge and Williams College in Williamstown observed the light from a star as it disappeared behind Charon and reappeared on the other side – an event known as a stellar occultation. Occultations provide important information about the size of remote bodies, as well as the makeup of their atmospheres (if they have them). According to team member Jim Elliot, a professor in MIT's Department of Earth, Atmospheric, and Planetary Science and in the Department of Physics, observations of a stellar occultation like this one have been made only once before, from South Africa in 1980. "We have been waiting many years for this opportunity," he said. "Watching the star vanish as it was blocked by Charon was spectacular." Although the star disappeared behind Charon for less than a minute, data from the observations provided considerable information about this tiny moon. In a paper released in the January 5, 2006, edition of Nature, the MIT-Williams collaboration determined Charon's radius to be 606 ± 8 km. For perspective, this radius is roughly twice the width of Massachusetts with an error of only 5 miles. The size was combined with mass measurements from Hubble Space Telescope data to establish a density for Charon of 1.72 g/cm3. This density, roughly 1/3 that of the Earth, reflects Charon's rocky-icy composition. What makes this achievement so remarkable is that the observation could only be made from a narrow, 650-mile wide region in South America. The MIT-Williams observers were located at four telescopes in Chile and one telescope in Brazil for the event. The largest telescope employed by the consortium was the 8-meter Gemini South Telescope on Cerro Pachуn. The observations utilized the Acquisition Camera, a guider instrument that is typically used for telescope pointing and target selection, as a high-speed photometer. Portable camera systems constructed by the MIT-Williams group were mounted on the other telescopes: the 6.5-meter Clay and 2.5-meter du Pont at Las Campanas Observatory in La Serena, Chile, the 0.8-meter at the Observatуrio Cerro Armazones in Anofagasta, Chile, and the 0.6-meter at Observatуrio Pico dos Dias, Itajubб, Brazil. Observations were successful at all stations excluding Brazil, which was clouded out. Jay Pasachoff, Professor of Astronomy at Williams College and a collaborator in the effort, praised the team doing the work. "It's astounding that our group could be in the right place at the right time to line up a tiny body three billion miles away," he said. "The successful observations are quite a reward for all of the people who helped predict the event, constructed and integrated the equipment, and traveled to the telescopes." Observations taken at a high rate, 10 frames per second, from the 6.5-meter Clay telescope (which was built by a collaboration of institutions including MIT) detected subtle optical effects caused when the starlight passed the edge of Charon's disk. By analyzing these effects, known as diffraction fringes, the MIT-Williams team concluded that any atmosphere on Charon is less than one millionth the density of Earth's atmosphere. Their analysis provided very strict limits on the amounts of various gases that could be present. 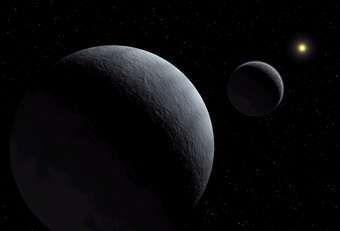 Three years earlier, the team previously used the technique of stellar occultation to study Pluto's thin atmosphere, showing that it was subject to slight global warming. The results of the observations argue against the theory that Pluto and Charon were formed by the cooling and condensing of the gas and dust known as the solar nebula. Instead, astronomers think that Charon was formed in a collision between two objects early in the formation of the solar system. "Our observations show that there is no substantial atmosphere on Charon, which is consistent with an impact formation scenario," said Nature lead author Amanda Gulbis. "We also find that Charon contains roughly 10% less rock by mass than Pluto. This difference suggests that either, or both, objects involved in a Charon-forming collision had concentrations of heavier materials in their cores." A collisional formation like this has a parallel in theories for the formation of the Earth-Moon system. Pluto has recently received considerable attention, with NASA's New Horizons mission to be launched in January 2006, the discovery of two new moons, and the discovery of several Kuiper belt objects that are Pluto-sized (or even larger). The success of the MIT-Williams team in observing the Charon occultation bodes well for their ability to observe occultations of different stars by these newly discovered objects. The so-called "10th planet" (2003 UB313), recently discovered by scientists from Caltech, is a prime candidate for stellar occultation observations. Although this object is approximately twice as far away from the Earth as Charon, it is thought to be twice as large. 2003 UB313 thus covers the same angular extent in the sky as Charon, just as the Moon and the Sun appear to be the same size although the Sun is physically larger. "We are eager to use the occultation technique to probe for atmospheres around large Kuiper belt objects," remarked Jim Elliot, who has been observing stellar occultations by bodies in the solar system for more than three decades. Members of the MIT team were Jim Elliot, Amanda Gulbis, Michael Person, Elisabeth Adams, and Susan Kern, with support from undergraduate Emily Kramer. The Williams College team included Jay Pasachoff, Bryce Babcock, Steven Souza and undergraduate Joseph Gangestad. The article describing this research is "Charon's Radius and Atmospheric Constraints from Observations of A Stellar Occultation," by A.A.S. Gulbis, J.L. Elliot, M.J. Person, E.R. Adams, B.A. Babcock, M. Emilio, J.W. Gangestad, S.D. Kern, E.A. Kramer, D.J. Osip, J.M. Pasachoff, S.P. Souza, and T. Tuvikene. It will appear in the January 5, 2006, edition of Nature. A team led by French astronomer Bruno Sicardy and a team led by American astronomer Leslie Young also observed the occultation from telescopes in South America. American astronomer David Tholen discussed the significance of the various results in a "News and Views" introductory article in the same issue of Nature as the MIT-Williams and Sicardy-team articles.